Unfortunately, I discovered the wonder of Living Colour relatively late in life for a rock ‘n roll fan. I was aware of them as a teenager when they were at their peak and I enjoyed their hits (Cult of Personality, Type, Love Rears Its Ugly Head), but I didn’t delve into their magnificent, flawless, timeless, hybrid, hard rock albums. I was too busy listening to Rage Against the Machine, a band heavily influenced by Living Colour. While Rage did a hard rock/rap cross over again and again, Living Colour had, and continue to have, no limits. Band founder and guitar legend, Vernon Reid, played in jazz bands and drummer Will Calhoun still plays with jazz combos and this influence is evident in all their albums. So too are reggae sounds, funk, hip hop and their distinctive hard rock base. “These songs go beyond the Black community. They deal with the Maori community – down there where you live. The Aboriginal community in Australia. The Native American communities and indigenous communities around the world. They’re not relegated to black and white issues. Some of our songs deal with gender discrimination, bullying, and those kinds of things. We write songs based upon what we experience in life. That’s what’s most fun about being a member of Living Colour”. But the band also explores climate change and environmental degradation (Time’s Up), the parlous state of the media (TV News), mental health (Flying, Postman) political apathy (Ignorance is Bliss) and they take a dig at white liberals with a large chunk of pessimism thrown in (Go Away) . On Friday night, before the lights had even dimmed the crowd digged on drummer Will Calhoun’s kit painted with the Aboriginal flag and the bass drum featured an image of Uluru behind the Living Colour logo. Nice gesture. The set opened with a cover of Robert Johnson’s Preachin’ Blues, a track that’s apparently going to appear on their long-awaited album, Shade, to be released in September. It’s a great song delivered with a hard rock oomph and mixed with the traditional blues of the original. Next came Wall from 1993; once a song of hope, it now sounds very depressing. Towards the end of the set the band made lots of jokes before launching into one of everybody’s favourite songs, Cult of Personality. Apart from feeling sorry for fans that saw them last time they were here (it was the same set list from 2014 when they played Soundwave), I wasn’t disappointed. 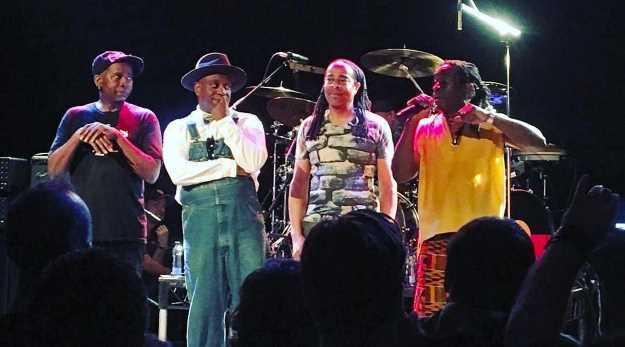 Living Colour sounded as amazing as they do on record (or on compressed Mp3) and played with passion and intensity. Singer Corey Glover seems to be able to handle any composition handed to him and the yelling and screaming that’s sometimes required appears to have had no ill effects after 30 odd years of doing this stuff. The highlight of the set was the thrashy, stop-start, and clearly, very difficult to play Mind Your Own Business from their album Stain. If somebody has given you the evil eye, I recommend locking yourself into a room, playing this song and whirling your head around in circles. Very cathartic. The band joked afterwards that there was a bum note or two. I didn’t spot it. But the biggest cheer of the night was for their huge hit Love Rears It’s Ugly Head, one of their few tracks that deals with romantic relationships. Solos can be boring, and bass player Doug Wimbish’s solo kind of was, but Will Calhoun’s drum solo was not just sonically awesome but visually spectacular. Halfway through the solo the lights were turned off and Calhoun’s drum sticks lit up like light sabres waving through the blackness and making a glorious cacophony.